Accord Ventilation floor registers have an attractive Charleston design that will enhance your home decor. 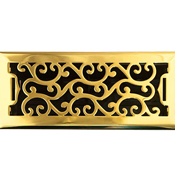 The brass floor vents are made of plated steel and feature a rustproof damper box. Each decorative metal floor register has a beautiful tarnish and corrosion resistant finish. 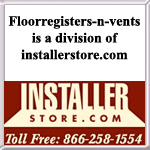 The strong polished brass floor vents are rated to hold up to 200 pounds. This Charleston floor register is available in sizes 4x10 and 4x12. 61-0913 4 x 10 5.25" x 11.5"
61-0914 4 x 12 5.25" x 13.5"
This attractive Charleston floor register design is also available in the finishes Matte Black, Oil Rubbed Bronze, Antique Brass and Satin Nickel.